SAN FRANCISCO, Oct. , 2010 – Ford is starting to release its Software Development Kit (SDK) to a new set of interested smartphone app developers so they can modify existing apps to work hands-free using voice recognition through Ford SYNC for safer command and control while driving. The SDK release marks the latest move by Ford to forge a more open collaborative bond with the wireless, consumer electronics and app developer communities to create a safer and smarter in-car connectivity experience that leverages the mobile devices customers own and love. With drivers spending nearly three hours per day in their vehicle according to a 2009 Arbitron National In-Car Study, there’s no doubt customers will be tempted to use their mobile device in the car. In fact, recent studies already indicate 46 percent of adult smartphone users have apps on their phones and 36 percent of those admit to using those apps while commuting. 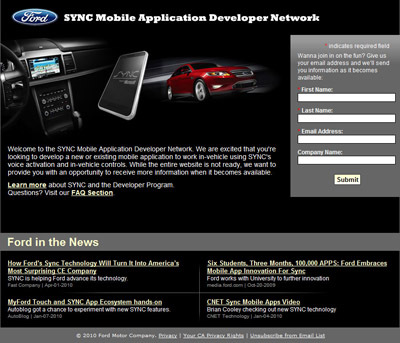 Understanding the potential of the SYNC application programming interface (API), app developers have been clamoring for the Ford SDK since the company announced the launch of the SYNC Developer website (www.syncmyride.com/developer). Since then, Ford has received and is reviewing more than 1,000 submissions from interested parties looking to modify existing apps or create all-new apps that can successfully interface with Ford SYNC through AppLink. As the software that leverages the SYNC API, AppLink can access mobile apps stored on a user’s smartphone, and allows them to be controlled through the SYNC voice recognition system. Pandora Internet radio, Stitcher smart radio and Orangatame’s OpenBeak are the first apps to incorporate the SYNC API, with more on the way in coming months. To keep the user experience seamless, Ford will leverage existing app stores for distribution of updated SYNC-enabled versions of apps. Owners of SYNC AppLink-equipped cars simply download the enabled app through the appropriate app store for their smartphone’s operating system. Being cautious with the SDK, Ford has developed stringent self-imposed guidelines for in-car app development, considering a whole set of parameters that make sense for the driving environment. Further down the road, Ford will also examine the potential of apps that can provide exciting new levels of safety knowledge as well as improvements in driver productivity and convenience.